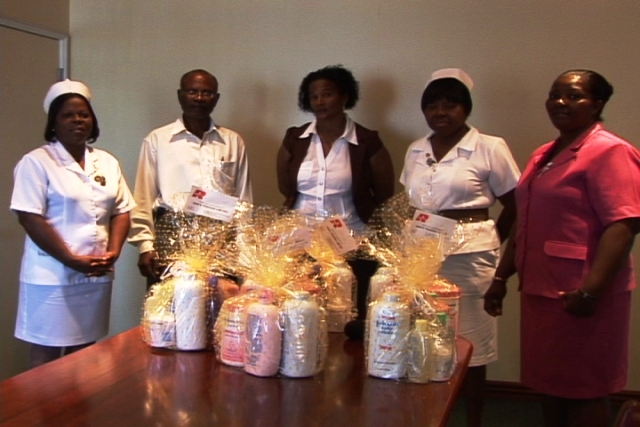 NIA-CHARLESTOWN, NEVIS (March 10TH, 2011) — Six newborn babies at the Alexandra Hospital will be the recipients of baby hampers from Rams Group of Companies. “We at Rams Group of Companies are always committed to our customers. We believe in giving back and so we are always reiterating our commitment to our and so I am very pleased to hand over these packages to the administrative staff at the Alexandra Hospital,” Mrs. Julius said. In accepting the baby hampers, Acting Hospital Administrator Mr. Joseph Claxton expressed his gratitude to the company for its “generous donation” and laid the foundation for a “strong relationship” between the entities. “We do hope that these would serve as an asset to the maternity unit and we hope that the Rams Group of Companies along with the Alexandra Hospital would continue to foster a good relationship,” he said. Also present at the handing-over ceremony were Matron at the Alexandra Hospital Mrs. Aldris Pemberton-Dias and Assistant Hospital Administrator Ms. Grace Elliott.